Note: Approx. Shipping Weight: 9.5 lbs. Span adjustment: 49", 57" or 65". Stand-off distance: 12" or 29-1/2". Rectangular stabilizer spans double windows. 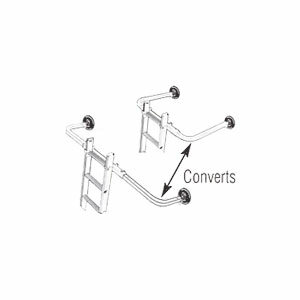 Quickly converts stand off distance for larger overhangs. Mounts quickly and easily. This comes with one (1) stabilizer, rubber pads, fleece bonnets, mounting hardware and instructions. Fits rail up to 3" x 1-3/16"